Patches and Patch Notes for Dark Souls 3 and its regulations are listed below. When patches are happening, it is not uncommon for the server to become unavailable even after you have patched. This is usually resolved between a few hours of patching, but if you're experiencing consistent errors please post in our forums to get some player help. If you came to this page by mistake and are instead looking for information on the NPC Unbreakable Patches, it can be found on this page. Temporary server maintenance will be carried out following the application of this update file. Fixed issue where the bonus souls earned by equipping the Mendicant’s Staff would not stack when equipped in both the right and left hands. Fixed issue where the two-handed R1 / RB attack of Friede’s Great Scythe did not have shield-piercing properties. Fixed issue where the increased damage effect of Bloodlust would suddenly disappear. Increased absorption and stamina recovery speed when summoned as the Spears of Church in a world with 2 or more White Spirits. Decreased cooldown time for Ritual Spear Fragment and Divine Spear Fragment when summoned as the Spear of the Church in a world with 2 or more white spirits. Fixed issue where the player was unable to use the bonfire despite having defeated the Demon Prince in The Dreg Heap. Fixed issue where further progress was disabled when interacting with the Crystal Sage Clone in a certain way. Animation cancel now available for whips except the Rose of Ariandel. Increased bleeding attack power for Bloodlust skill attached to Bloodlust. Increased luck for poison, bleed, and hollow-infused and decreased stamina consumption of Astora Straight Sword. Decreased stamina consumption for Aquamarine Dagger’s Crystal Blade skill. Fixed issue where no more stamina was required to use the Repeating Crossbow weapon art when the player did not have the minimum stats. Fixed an issue when a female character or a male character wearing the Reversal Ring uses the Repeating Crossbow art, the character would move forward without any analog stick input. So, in a nutshell: bye-bye Force+Throwing Knife glitch! Infusions have been readjusted following the 1.32 mistakes. A nice buff for invaders! 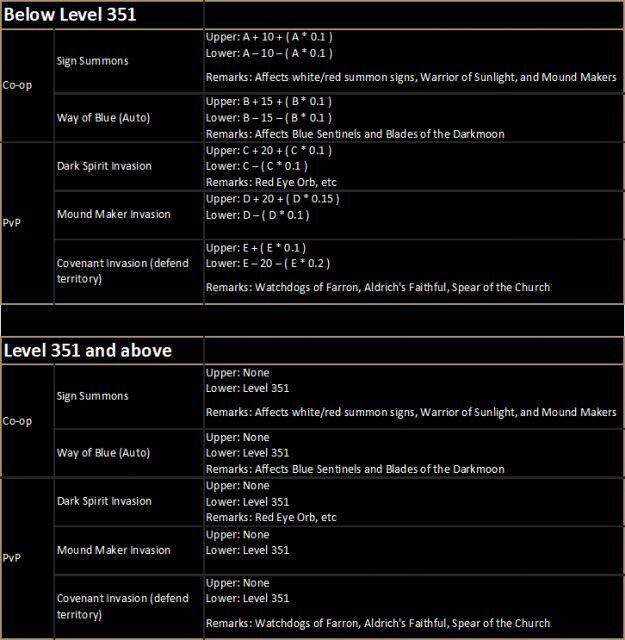 SL =Invader’s level for Dark Spirit / Moundmaker and Host’s Level for Covenants. Reduced damage of the light arrows fired by Angels. The sorcery Hidden Body is now effective against Angels. Reduced the damage of homing spears released from Spear of the Church. Reduced the amount of bonus absorption the Spear of the Church receives during 1vs2, 1vs3 and 1vs4 games (1vs1 is unaffected). Reduced the amount of HP "Church Guardian" has during a 1vs1 match (1vs2, 1vs3 and 1vs4 are unaffected). Increased damage and scaling of simple, crystal, fire, chaos, lightning, dark, deep and blessed infusions. Increased damage of raw infusions. Reduced damage and scaling of heavy infusions at lower weapon levels. Increased scaling of sharp infusions, and increased damage gain at high levels of dexterity. Reduced scaling of heavy infusions on lighter weapons. Reduced damage of Exile Greatsword. Reduced damage for L1(LB) attacks, and increased stamina consumption for L1(LB) attacks and weapon art "Ember" of Ringed Knight Paired Greatswords. Fixed a bug where the weapon art Wind Wheel of Splitleaf Greatsword was applying more status effects than intended. Fixed a bug where fully charged R2(RT) attacks of Profaned Greatsword and Black Knight Greatsword were not consuming additional stamina. Fixed a bug where the weapon art of Preacher's Right Arm would combo for more hits than intended. Fixed a bug where the weapon art of Painting Guardian's Curved Sword would combo for more hits than intended. Increased damage of Toxic dealt by players, but reduced the penalty to stamina regeneration. Fixed issue where an item could be used simultaneously with the Dragon Head Stone if the player performed a quick turn while changing the item display. Fixed issue where a currently equipped item would be replaced with an item taken out from the character's inventory box if the items had the same name. Made system updates for The Ringed City. Increased frame rate for gameplay on PlayStation®4 Pro. 2 New maps added to Undead Match, Dragon Ruins and Grand Roof. Added function to Undead Match where, if password matching is used, players can split into teams. Added function to Undead Match that allows one team of players to match with one password, and the other team to match with another password. Added function where various hosts could be displayed on the bonfire warp menu. Added warning text that advised player if he/she has dropped too many items in a single location on the field. Fixed issue where the loading screen was displayed for longer than usual when the guest returned to his/her own world after an online multiplayer session. Fixed issue in “The Painted World of Ariandel” where the opened/closed status of the door to the Cleansing Chapel did not synched properly during online multiplayer session. Fixed issue where a guest could enter alone into the boss room for the Dancer of the Boreal Valley during online multiplayer session. Fixed issue where the level sync feature in Undead Match did not synched consistently during online multiplayer session. Fixed issue in the loading screen where guests were not alerted to an error that occurred on the host’s side during online multiplayer session. Fixed issue when player using the miracle Tears of Denial doesn’t get attacked during online multiplayer session. Fixed issue where weapons and items sent to the box get corrupted when inventory is full. Fixed icons that specify which certain items are for which gender. (ex. Chain Armor). Improved attack power for Daggers. In accordance with this fix, critical hit is decreased in order to make critical power the same as present. Improved motion of normal attack for Ultra Greatswords, Great Hammers and Curved Great Swords. Decreased stamina depletion when attacking using Ultra Greatswords, Great Hammers, and Greataxes. Improved attack power for Curved Greatswords. Decreased motion of normal attack while dashing for Katanas. Improved motion of any other normal attacks. Improved motion of shield bash skill. In accordance with this fix, stamina consumption has been reduced. Improved motion of Dagger’s Blind Spot skill. Increased rate at which Frostbite builds up when using Vordt’s Great Hammer, Irithyll Straight Sword, and Friede’s Great Scythe. Shortened attack window of Carthus Curved Sword and Dark Sword, Gargoyle Flame Spear and Follower Sabre. Improved motion of Crescent Moon Sword’s skill, Crescent Blade. Improved the motion of Moonlight Greatswords’s skill, Moonlight Vortex. Improved FP recovery effect of Executioner’s Greatsword. Fixed so that Frost Blade appears from the beginning of Pontiff Knight Curved Sword skill. Improved FP decrease effect of Yorshka’s Spear skill, Pacify. Improved motion and the frost effect of Pontiff Knight Great Scythe skill. Improved motion of normal attack for Greatlance. Fixed so that poise is applied during Greatlance two-handed attack. Fixed so that poise is applied during Dark Hand skill, Lifedrain. Disabled parry during Pickaxe’s two-handed attack. Improved duration of the Perseverance effect. Fixed issue where attack power of some bolts was different from the assumed value when using Avelyn. Fixed issue where one-handed attack motion of Crow Talons was incorrectly using the animation for the Fists. Fixed issue where player can apply enchantment of Bloodlust to other weapons. Fixed so that poise is applied during Spin Sweep attack. Fixed issue where Onislayer continued to attack consecutively. Improved correction value for Sharp or Heavy weapons’ upgrade. Improved the Bleed build-up of Blood infusions. Reduced Bleed build-up of weapons not infused with Blood. Improved the Poison build-up of Poison infusions. Along with improving correction value for Sharp or Heavy weapons’ upgrade, adjusted correction value for Refined weapons’ upgrade. Improved defense and also decreased weights for heavy armor. Improved the motion of Lightning Stake, Lightning Storm and Way of White Corona. Extended the time you can move during the casting of the miracles of Gnaw, Dorhys’ Gnawing and Wrath of the Gods. Fixed issue where bonus value is not affected by Dark Damage when equipping Hornet Ring during critical attack. Increased the damage of Poison and Toxic dealt by players, and shortened its duration. Decreased rate at which blood builds up when using Carthus Rouge. Fixed issue where a player could invade another player during a boss battle. Fixed issue where an enchantment could be applied to weapons which normally could not be enchanted. Fixed issue where, when items are used while casting magic, display glitches could occasionally occur. Fixed issue where it was possible to cancel immediately into a second magic spell after casting the first one. Fixed issue where the first part of a skill action could be skipped. Fixed issue where a single item could be used indefinitely. Updated multiplayer in the Painted World of Ariandel so that guests can also fight Sir Vilhelm. Fixed an issue in the Painted World of Ariandel where Sir Vilhelm would get trapped in the rocks. Fixed an issue in the Painted World of Ariandel where Sir Vilhelm would disappear/reappear in certain areas. Fixed an issue in the Painted World of Ariandel where the character name is not displayed when locked on to Livid Pyromancer Dunnel. Fixed an issue where it becomes impossible to progress further in the game because, Friede occasionally does not respawn as Blackflame Friede. Fixed an issue in the Painted World of Ariandel where the Gravetender Greatwolf would not appear in the battle. Fixed an issue in the Painted World of Ariandel where a crab enemy would float in the air if led to a certain location. Fixed an issue in the Painted World of Ariandel where a certain Birch Woman would suddenly appear directly in front of the player. Fixed an issue in the Painted World of Ariandel where certain crystal lizards would not move until they began to attack. Fixed an issue in the Painted World of Ariandel where the crab enemies movement patterns would change if the player repeatedly saved/loaded data near them. Fixed an issue in the Painted World of Ariandel where the knight enemies in the tower would disappear if the player repeatedly saved/loaded data in that area. Fixed an issue in the Painted World of Ariandel where a bridge would break in the host’s side, but not on the guest’s side. Fixed an issue where the application would freeze upon trying to load a 6-Player Undead Match. Fixed an issue in the Undead Match where the controls at times become unresponsive when joining a session. Fixed an issue in the Undead Match where consumable items were not restored after the battle ended. Fixed an issue in the Undead Match where the player is unable to see other players’ sorceries such as Homing Soulmass, Homing Crystal Soulmass, etc. Fixed an issue where some motions which were improved in patch 1.08 did not take effect when a weapon was equipped to the left hand. Fixed an issue where the weight of Curved Swords fluctuated in Regulation 1.22. Fixed an issue where the player can fall from any height by repeatedly performing the Crow Quills skill while the Silvercat Ring is equipped. Fixed an issue where player could not be absolved of sin as long as Siegward of Catarina remained in Irithyll of the Boreal Valley. Fixed an issue where the player was able to leave the area during the battle with the Crystal Sage. Fixed an issue in the Grand Archives where the Elder Prince, Lorian would warp outside of the boss area. Fixed an issue in the Grand Archives where a boss battle would start upon returning from a multiplayer session. Fixed an issue where the guest could enter the boss area before the host. Fixed other issues and adjusted game balance. Fixed an issue where bleeding damage could not be inflicted with Eleonora. Fixed an issue where Faith did not scale correctly for Friede’s Great Scythe. Increased player’s resistance to physical attacks when equipping Ultra Greatswords, Great Hammers, and Greataxes. Increased player’s resistance to physical attacks, and increased damage done to opponent’s guard when equipping Halberds. Reduced attack power of the Carthus Curved Sword and the Follower Sabre. Increased power of the Way of White Corona. Increased the area of effect for Bursting Fireball. Increased length of effect for Charcoal Pine Bundle and Gold Pine Bundle. Detailed notes as found by the community can be found on the This thread. System updates for DLC “ASHES OF ARIANDEL“. Adjusted poise values across the board. Poise is now more effective for heavier weapons and armor. Improved regular attack animations of hammer category weapons. Improved regular attack animations of greatsword category weapons. Improved regular attack animations of axe category weapons. Improved regular attack animations of fist category weapons. Improved the “Neck Swipe” weapon skill animation of scythe category weapons. Fixed a bug where strong attacks performed using whips would not deal additional damage when fully charged. Fixed a bug where strong attacks performed using the Pickaxe would consume stamina multiple times per attack. Adjusted the “Onislayer” weapon skill hitbox timings for Onikiri and Ubadachi. Adjusted the hitbox timings of the claw category weapon skill “Leaping Slash“. Fixed a bug where rolling attacks on Astora’s Greatsword could not be parried. Improved the “Wrath of the Gods” weapon skill animation for Wolnir’s Holy Sword. Improved the “Blind Spot” weapon skill animation for Corvian Greatknife andHandmaiden’s Dagger. Improved the “Shield Splitter” weapon skill animation for Mail Breaker and Irithyll Rapier. Improved the “Wolf Leap” weapon skill animation for Old Wolf Curved Sword. The weapon skill of Old King’s Great Hammer “Molten Perseverence” will now release lava on both hits. Improved the “Darkdrift” weapon skill animation for Darkdrift. Reduced effectiveness of rolling attack animations on Gotthard Twinswords while dual wielding. Increased effectiveness of the sorcery “Pestilent Mercury“. Improved the cast animation of miracle “Lifehunt Scythe“. Increased poison and toxic buildup of the pyromancies “Poison Mist” and “Toxic Mist“, respectively. Increased durability damage buildup of the pyromancy “Acid Surge“. Increased duration of the “Warcry” weapon skill. Fixed a bug where the player’s lock-on target would automatically change even if “Toggle auto lock-on” was set to “OFF”. Fixed a bug where the leader board for Darkmoon Knights would display incorrect statistics. Fixed a bug where the fog wall near Holy Knight Hodrick would sometimes not disappear during multiplayer even after defeating him. Fixed a bug where Orbeck of Vinheim would sometimes die before the player purchased all his spells. Fixed a bug where Patches and Greirat would never return if sent to steal after defeating all bosses. Fixed a bug where female characters were subject to counter damage during certain movement animations. Fixed a bug where equipping Vordt’s Great Hammer or Irithyll Straight Sword in the left hand would cause enchantments to disappear from weapons in the right hand. Fixed a bug where two-handing certain weapons would cause the stealth effect onSlumbering Dragoncrest Ring to not work correctly. Fixed a bug where Hornet Ring was not working for claw category weapons. Fixed a bug where dash attacks could not be performed using Farron Greatsword. Fixed a bug where strong attacks using Lothric Knight Sword were not dealing thrust type damage. Fixed a bug where dash attacks using Onikiri and Ubadachi were not dealing thrust type damage. Addressed other game balance issues and fixed other flaws. The length of the Hammer skill, Perseverance (reduce damage when activated), has been increased //note: the Japanese says "Large Hammer Category"
Detailed notes as found by the community can be found on the Dark Souls III Forum (individual thread pending). Detailed notes as found by the community can be found on this thread. All Dagger weapons: increased critical attack power. Dark Sword: reduced weapon efficiency. Anri’s Straight Sword: reduced scaling effects. Wolnir’s Holy Sword: added faith scaling and adjusted weapon efficiency accordingly. Crescent Moon Sword: added intelligence scaling and adjusted weapon efficiency accordingly. Morne’s Great Hammer: added faith scaling and adjusted weapon efficiency accordingly. Lothric’s Holy Sword: added faith scaling and adjusted weapon efficiency accordingly. Yorshka’s Spear: increased FP damage effects. Greatsword of Judgement: increased attack power. Heysel’s Pick: increased intelligence scaling. All shield-piercing weapons: added shield-piercing properties to regular attacks. All Skills that enchant a weapon with special properties: extended length of effect. Obscuring Ring: increased distance at which ring takes effect. Lightning Stake: now requires 1 attunement slot. Magic Barrier/Great Magic Barrier: extended length of effect. Divine Pillars of Light: increased attack power. White Dragon Breath: reduced stamina consumption. All Bug Pellet items: extended length of effect. App Ver 1.05 Regulation 108 - Friday, June 10th. You can read a list of detailed player-found changes here. Archdragon Peak: Fixed the freeze when jumping into the fog after ringing the bell. The Rinfinger Leonhard quest will now start properly after the removal of the restriction on the maximum number of Pale Tongues that can be offered to Rosaria, Mother of Rebirth. Trophies will now unlock correctly even if the required item is sent directly to the storage. The Horsehoof Ring (which increases stamina drain of attacks) will no longer affect other attacks besides its initial effect on kicks. It will no longer be possible to equip a helm when using a Wax Pool after using the Dragon Head Stone. Fixed the HP drain damage of Symbol of Avarice when resting near bonfire. Fixed a spell animation and effect not synching up when using the magic repetitively. Fixed when summoning the white phantom NPC under a certain circumstance, the character's collision will properly function nullifying all enemy attacks. Fixed issue where skills could be performed even when a certain amount of FP was not available. Adjusted the attack cancel parameters of some curved swords attacks. Adjusted the attack power and skills of fist and claw weapons. Adjusted the skills of twin blade weapons. Fixed the scythe not penetrating shields at close distances. Adjusted stamina consumption and attack cancel parameters for rapier weapons. Adjusted the attack collision for the washing pole weapon. Adjusted parameters of Farron Hail and Busting Fireball. Adjusted casting speed, stamina consumption, cancel timing of some Spells. Increased the number of arrows/bolts that can be possessed. During online multiplayer: During the invasion of a Dark Phantom, the host will no longer be separated from his area. During online multiplayer: A dark phantom can no longer be forcibly brought back in some maps. During online multiplayer: When the player is summoned during a boss battle, the boss will no longer become motionless even after the player is back to his/her world. The status effects below the stamina gauge will no longer be hidden when opening the top menu with HUD display set to auto. The voice chat icon will now remain visible when the HUD display is set to "Auto." Fixed the display of strength level shown in the equipment menu when using two-handed weapon. Other game balance parameters have been adjusted. We thank you for your understanding! Embrace the Darkness! Dark Souls III will be updated to Regulation Version 1.07. The update will improve the Password matching feature. Unnofficial change list (detailed) can be found on this thread. Fixed the stamina attack of the partial weapon category. Improved the matching of the Blade of the Darkmoon and the Blue Sentinels covenants. The range of the matching level of the Blade of the Darkmoon and the Blue Sentinels have been adjusted. The efficiency of the following categories has been adjusted: Short Sword, Twinsword and Magic. Other game balance improvement and bug fixes. Fixed several other bugs, improved performance and adjusted balance. Corrected an issue where unvisited bonfires would be lit and visited bonfires would become inaccessible. Corrected an issue where players would not receive the benefits of burning an Undead Bone Shard at a bonfire after multiplayer sessions. Corrected an issue where players would receive souls after being summoned in multiplayer. Introduced a function so that the Fire Keeper and Velka the Goddess of Sin may return the player to life form. Fixed several performance and bugs, and balanced several items. Reduced the damage of the Fume Ultra Greatsword. Fixed an issue where if players would become unable to warp at the Firelink Shrine (amongst other issues) if they had fought the Large Crystal Lizard in Cemetery of Ash before finishing the game install. Fixed an issue where players would be returned to their world as red phantoms after engaging in PvP or covenant PvP activities. Anyone else confused with the out of nowhere 683MB patch? Dont leave halfway through from fixing this game dammit. Can you still do the tree trick jump? Or did they patch it? Are the servers down on PS4? I cant logon plz help!?! Do another update that bring the Seed of a giant tree back to its original state please!!!!! Nerfing it was such a bad idea, it just ruined one really fun multiplayer mechanic, being a veteran invader and host, i just loved the way it changed the whole thing, it was even refreshing to invade someone with a seeded world, it just added beautiful chaos to the whole experience! they should make a new dlc this game is getting boaring, doing the same stuff. make like new enermys and new armor set and new bosses. not the same bosses from other dark souls. and dont put any other dark souls armor because whats the point, ds3 needs to step up on their games. any idea when/if there&apos;ll be another patch? Any patches for offline invaders? It seems that at some point, you can&apos;t be invaded by red phantoms, including NPCs. MY TUMBLEBUFF. MY HOMEWARD BOSS INVASIONS. MY INFITE REBIRTHS. increase the reaper class (except corvian and friede) damage by 30%. double the speed of neck swipe and let it combo into r1 if done properly. fix the force buff glitch and decrease the damage of all straight swords by 15%. Fume Ultra Greatsword AR increase pretty please?! Fume Ultra Greatsword AR increase please? !